Imagine it, and it will be so. Georg Weiss took a leap of faith last winter when he left Porsche and went with Ferrari, taking long-time co-drivers Oliver Kainz and Jochen Krumbach with him. Not since 2011 was Ferrari triumphant at the Nordschleife when Farnbacher Racing took Ferrari’s sole VLN victory. The lure of the Italian machines, however, was too big for Weiss to resist. He followed his heart and left Manthey Racing to team up with Rinaldi Racing, bringing Ferrari back to the top class in VLN. Georg Weiss imagined it, and in the 59. 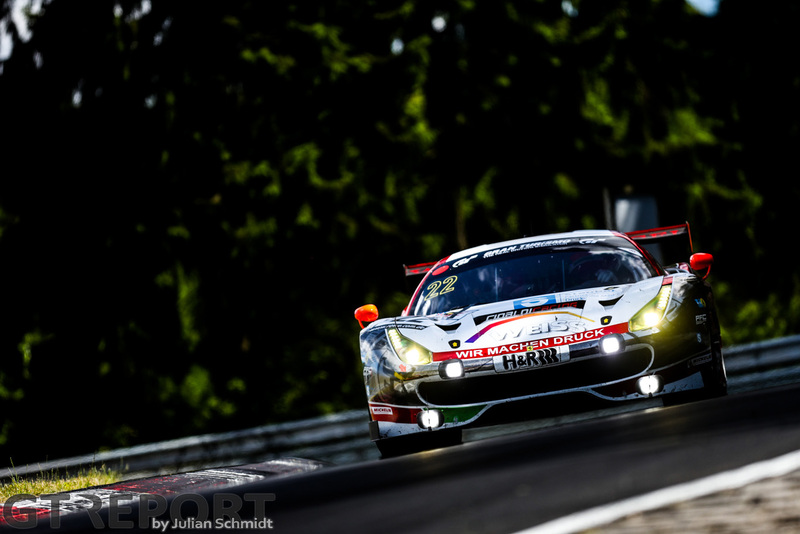 ADAC ACAS H&R-Cup took Wochenspiegel Team Monschau to make it two for Ferrari. 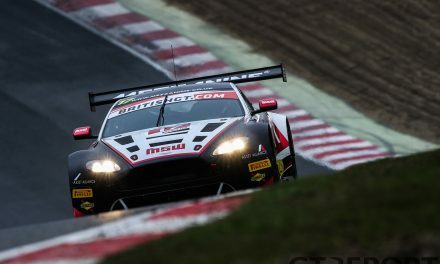 While most of the top teams are still recovering from the 24 Hours of the Nürburgring and others flown out to the French coast for the Blancpain GT race at Paul Ricard, a small group of eight GT3s return to the Nordschleife to set the second half of the VLN season in motion. A change in the Balance of Performance have given the Porsches a little bit more power. 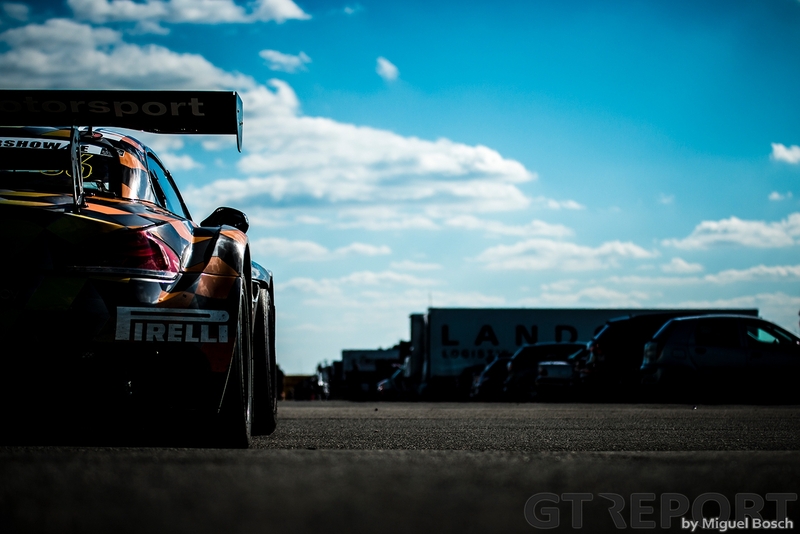 Despite winning the first two VLN races, the Stuttgarter brand was lost at the 24 Hours. A little help to even things out was needed, and it shows at the end of qualifying. 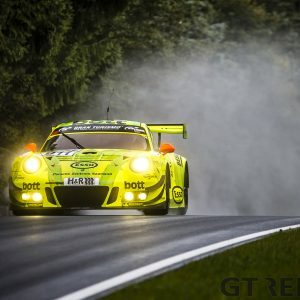 The number 59 Manthey Racing customer car of Stefan Widensohler has claimed the front spot on the grid, courtesy of sub-8 minutes lap by Sven Müller who held off the number 22 Rinaldi Racing Wochenspiegel Team Monschau Ferrari 488 GT3. The Ferrari another car given some BoP help. 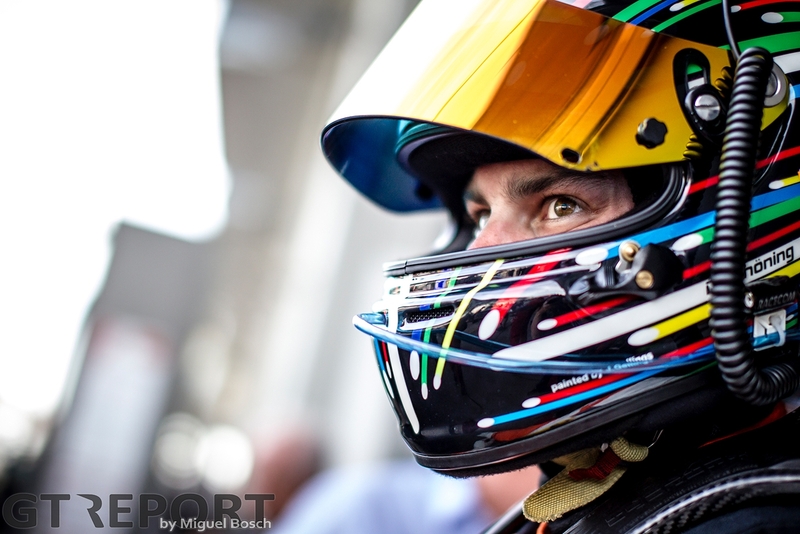 Müller is also the man behind the wheel of the Porsche 991 GT3R when the lights go green at noon. He’s stalked in the opening hour by Jochen Krumbach in the Ferrari. Krumbach is working hard through traffic, reeling in Müller and then letting go again before coming back. Krumbach is pushing his old team forward, but never finds his way through. With the beginning of the second hour comes the second stint. 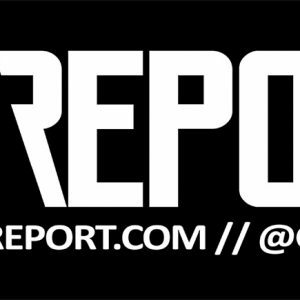 This is where the game is changed. Having made their pitstop a lap earlier, the number 12 Manthey Porsche owned and raced by Otto Klohs, who shares his car with youngsters Lars Kern and Mathieu Jaminet, is promoted into the lead when the rest of the lead group comes in for their stop. 29-year-old Kern, who left motorsports many years ago to pursue a career as a test driver at Porsche, is back in racing since last year and in the first two stints going like he has to make up for the five missed years. 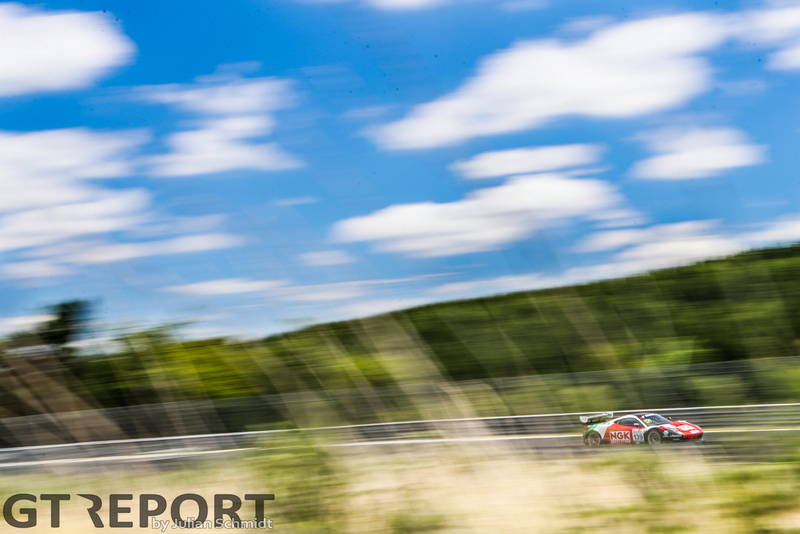 Oliver Kainz, entrusted with the Wochenspiegel Ferrari after Krumbach’s stint, is staying the course and remains close to the Porsche, not losing sight of Kern. Halfway through the four-hour race car owner Otto Klohs gets behind the wheel of his Porsche. The gentleman driver takes over from Kern with the task of controlling the time lost with the gentleman driver in action. It takes a while for the rest of the frontrunners to come in as well for their final full-service stop. 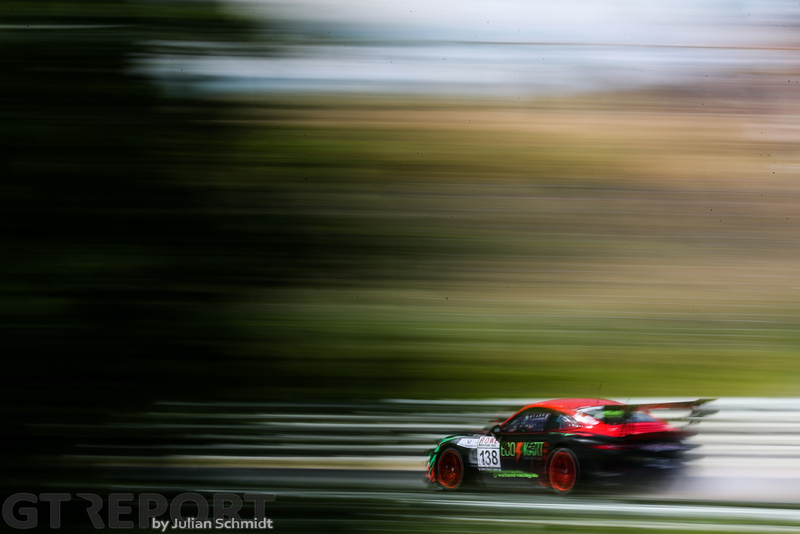 When they finally arrive with one and a half hour to go, Kainz hands the Ferrari back over to Krumbach. Georg Weiss, the car’s Am driver, is still waiting in the pit box for his stint. 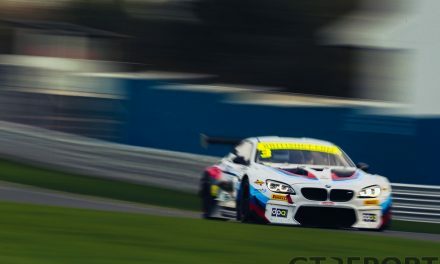 The team has decided shortly before the start to go for victory and reduce Weiss’s drive time to the bare minimum required to be scored in the Pro-Am category and keep the car going at its full potential until the final few laps. The compromise turns out to be the winning move of the race. While Manthey elects to give Klohs a full stint of over an hour, Krumbach and Kainz squeeze every last bit of speed out of the Ferrari. During the half hour in which the Porsche and the Ferrari race out of sync of each other, Kainz laps quicker than Klohs, giving the Ferrari the upperhand in the second half of the race. When the Ferrari with Krumbach returns to the track he’s well clear of Klohs’s Porsche and won’t let go of the lead anymore. 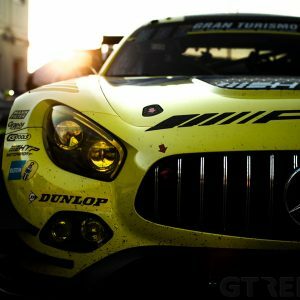 Over at Land Motorsport, the newly crowned 24 Hours of the Nürburgring champions have to make do with Jeffrey Schmidt and Michael Ammermüller for the weekend, with Audi R8 LMS GT3 regulars Christopher Mies up for Blancpain GT duties and Connor De Phillippi out with illness this weekend. 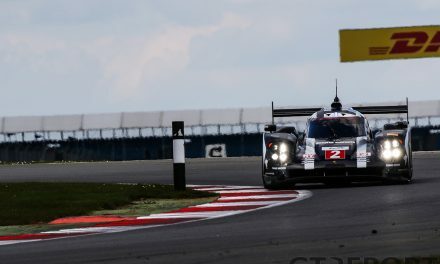 Neither Schmidt nor Ammermüller disappoint, enjoying a near-impeccable race only hindered by a Friday night change in the Audi’s Balance of Performance. 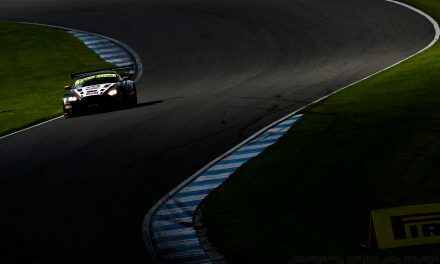 Schmidt is assigned the final two stints in the Audi after teammate Ammermüller kept it steady in the higher regions of the charts. The Swiss emerges in second when the final hour arrives and looks set for second place, and might even make a push for first later on. There’s one final quick pitstop to be made by the leaders except for Mathieu Jaminet whose number 12 Manthey Porsche was fully filled up a short while ago. As the half-hour to go mark has been passed, all pit time limitations are lifted. It’s completely up to the pit crew to make the difference. One by one they arrive to their pit markers. First in is Krumbach, who gives the car to Weiss for his three-lap dash to the finish. Then Schmidt arrives for some quick litres of fuel. Wolfgang Land looks on as his men hook up the fuel hose, get the needed gasoline in, drop the car… And then nothing. The car remains silent, it won’t start. An electrical problem with the end in sight kills the team’s chances of whatever stunt they might have had in mind. Stranded in pit lane, seconds tick away, competitors pass by. A minute is gone when the V10 engine roars back to life. Schmidt has dropped back to fourth position. Back in the game and Schmidt is pushing. But with only 17 minutes left to the chequered flag, the fight for second is lost and if it wasn’t for two time-penalties accumulated by the strong-running mcchip-dkr.com Renault Sport R.S.01, they would’ve missed out on third place as well. The Renault’s penalties promote Land onto the podium after Schmidt unnecessarily double-times it in the final laps. In his one-hour stint, Jaminet can’t bring the Manthey Porsche on the rear of the leader. Soon enough the young Frenchman realizes that the gap of multiple minutes to the Ferrari is too big to overcome, instead setting his sights on securing a place on the podium. Jaminet smells blood when Schmidt stalls in pitlane, claiming second place for his team. 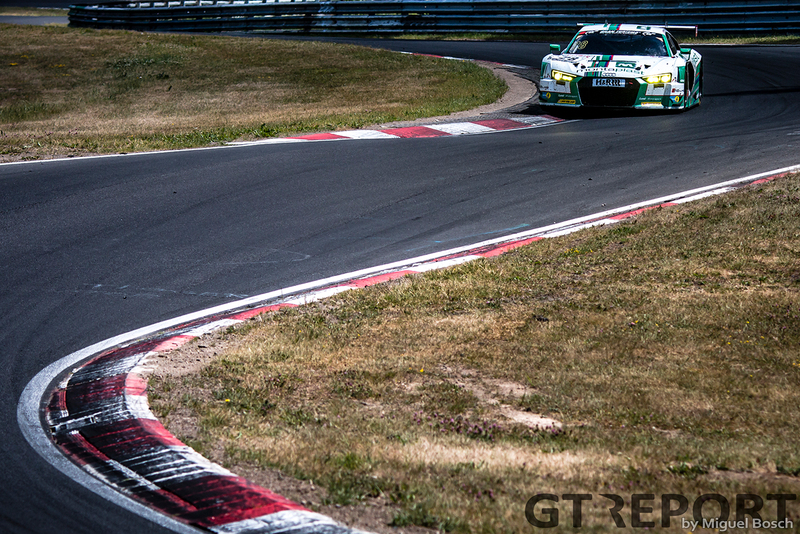 After the pitstops have cycled through, the road to victory is clear for Georg Weiss. All he has to do is guide the Ferrari to the finish and that he does. As he’s greeted home by the jubilant Rinaldi crew and co-drivers Jochen Krumbach and Oliver Kainz, all the time, passion, money, hard work, energy and imagination put into the team over the years is rewarded with a much-acclaimed win all along pit lane.